JOGAL is a local brand in USA which is a company that carries men's basic and fashionable unique clothes,all the clothing are factory directly sell. Hand Wash Recommended / Washed without Fading. 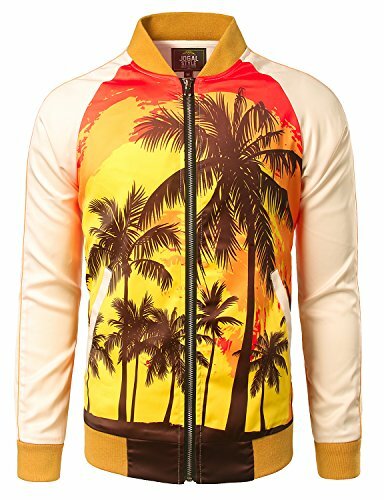 Unisex 3D Digital Printed Sunset Coconut Tree Beach Couples Zipper Top Coat Varsity Baseball Bomber Jackets. Slim fit in standard US size,So if you want to loose fit,you'd better order one step bigger size than your original size. JOGAL unique design jacket can let you become an eye-catching fashion master in this winter ! It's the perfect choice for present or as a CP sweaters in trend. Casual ,Slim Fit,Lightweight,Contrast Colors,Comfortable Smooth Fabric,Rib-Banded Collar Cuff and Hem, Long Sleeve,Two Side Pockets,Zipper Closure Varsity Baseball Bomber Jackets. And it is good jackets for the change of seasons. If you have any questions about this product by JOGAL, contact us by completing and submitting the form below. If you are looking for a specif part number, please include it with your message.